Versatility is up to creativity, of course not entirely but I would say mainly. It involves some ‘thinking out of the box’ and some daring points to do so. 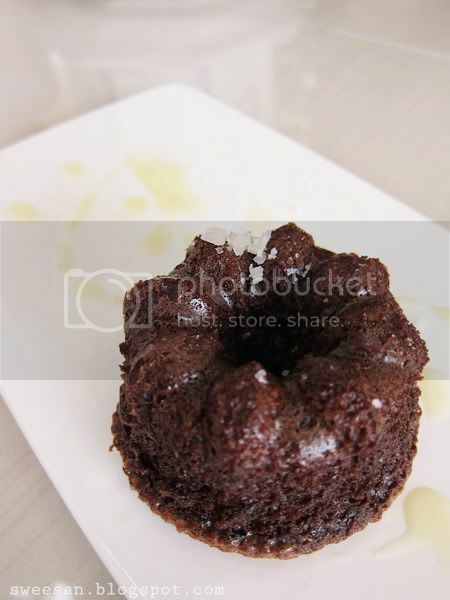 As usual, I was blog-hopping on some of my favourite food bloggers, I came across Ellie’s Gateau au Chocolate à la Fleur de Sel et Huile d’Olive. Quite a name huh? I looked at it for a while and my mind just went “Ok I have to do this”. Its just like if you’re in a new place and you meet a bunch of new people. Some you may click with and some you may not relate to. Baking for me is just like that; how it clicks. It doesn’t have to be a very complicated recipe or an over the top one. If I like what I see, I’ll try it, very simple! And just like this cake, it’s pretty simple to make. You don’t have to use a mixer if you want some hand workout haha, in which I did. After a while, I paused and see, how many eggs did I actually cracked in it? 2 ? 4 ? .. Must be four =__= It’s gonna be one hell of a whisk. But oh well, I used to do everything without mixer when I first started out at Le Cordon Bleu for 3 months. No turntable, mixer, dough presser, etc; everything has to be done by hand! So it wasn’t too much for me to handle, furthermore I like whisking it by hand just to feel the lightness of the eggs.. It worked out just like using mixer so I was more than happy yay! Melt the chocolate in a heat proof bowl over a saucepan of hot simmering water. add butter and stir well to mix the two ingredients completely. 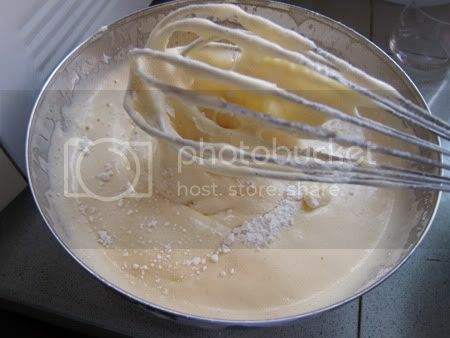 Put the eggs and the sugar in a bowl and whisk with kitchen mixer until the mixture turns pale and doubles in volume. Add the flour, a tablespoonful at a time, and the baking powder. 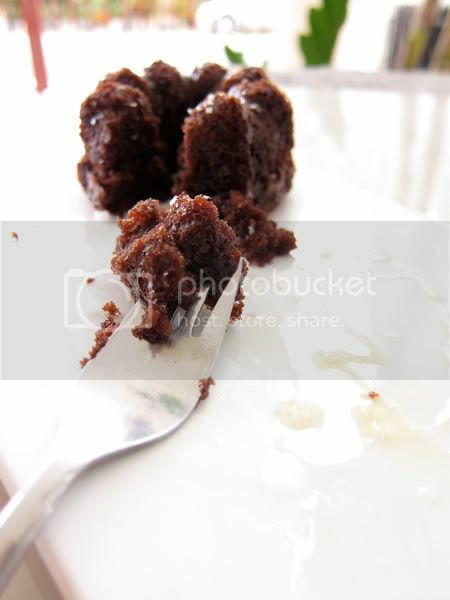 Mix in the chocolate mixture, pour the lot into silicon pans / 8″ moulds and bake for 30-40 minutes. The cake is cooked when a knife inserted into the centre comes out clean. Leave the cake to cool for 15 minutes before turning out. To serve, cut the cake into slices, set them on plain white plates and pour some extra virgin olive oil around. Sprinkle with some fluer de sel on the cake and serve. How it tasted? Look quite easy to prepare huh. Who can resist a good choc cake like this! This cake looks so moist & tempting! 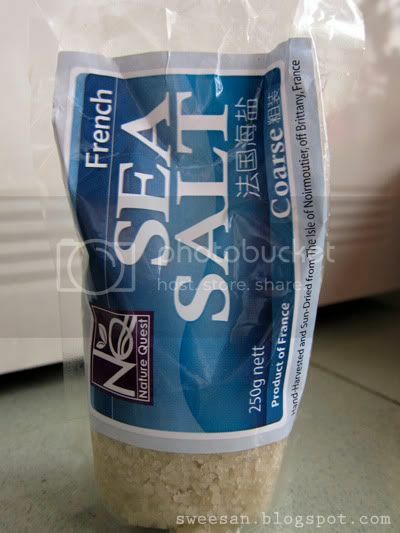 I bet the sea salt works great by giving the cake extra character. We should really hang out together with the other ladies … I really wanna bake those deadly sables korova for you all with fleur de sel! It's Pierre Herme's recipe!! So good! Btw, are you using Valrhona's for anything choco? @Sonia, I bought new camera already, still trying different settings ..
Swee San, I just had to come by, cos Ellie told me you made this cake too! What a coincidence. 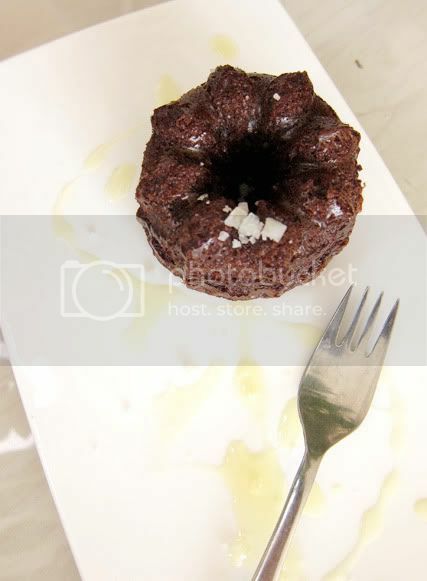 🙂 Great idea to bake it in a mini bundt. It's so pretty. And I can't believe you whisked by hand!!! Ju : I wanted to make half of the recipe so I decided to do it by hand, but I measured wrongly and oh well, just continued with it.. You should try the cake, it's good ! 3rd time I see this cake, first at Ju, then at Ellie's, now yours. Really feel like tasting it now…. Isn’t 200degC rather high for cakes? (Sorry, novice baker here). Is that temp for non fan asisted ovens? Thank you! Non fan ovens, 200 C are for sponges / lighter cakes and takes shorter time to cook. thus lighter.